Today I opened my “Journey to Auschwitz” lecture using that phrase at a local church for a county extension group. I have spoken all over Indiana at public libraries and schools, telling my story and I nearly always use that phrase because it is so true. Before hearing Eva for the first time at CANDLES in 2012, I literally knew nothing about the Holocaust, except for the number six million. I was at a summer conference at Indiana State University for teachers who have won fellowships from Lilly Endowment and a trip to CANDLES was an option one afternoon. I had vaguely heard of her and thought it would be interesting. I enjoyed her lecture, and after the talk, we had books signed by Eva and I took photos of each teacher with Eva. When Eva signed my book, I mentioned to her that I was a twin. Eva said, “Oh, all the twins who hear me tell me that.” My response was “well, Eva, have any told you that there are TWO sets of twins in their family?” Eva sat up and leaned forward and said, “oh, Charles, Dr. Mengele would have LOVED you!” Needless to say, that gave me chills, and little did I know that within three years I would be standing with Eva in Block 10, where Dr. Mengele performed his twin experiments. I have also stood at the autopsy table in Block 10, where Eva and Miriam could have easily ended up. I left CANDLES that day without a passing thought of traveling to Auschwitz with Eva Kor. But that was to change. Fast forward to March 25, 2014 at 12:07 AM in Bedford, Indiana. After a long, 30-mile night training run with running friends at Morgan Monroe Forest, I stopped at a Denny's for a meal before heading home to Seymour. I was training for my first 100-mile trail race at Chain 'O Lakes State Park that was only five weeks away. I left Denny's and almost immediately was T-boned at the Highway 37 intersection by a drunk driver. He had run a red light and I have no recollection of the accident. I later woke up in the helicopter that was about to take off for Methodist Hospital. I had been crushed and trapped in my car and the driver had run on foot, away from the scene. I was cut out of my car and flown to Indianapolis. I had received four complete pelvic fractures, a totally split sacrum, broken ribs, broken neck and internal bleeding. Fortunately, I was treated by a sports ortho doctor that night, who learned that I was an ultra runner. He told me I was in for a long rehab, but he felt I could get through it all without any pins, screws or plates, IF I sat still for two months. And I did, and that is why I am now connected so strongly to Eva, CANDLES and Holocaust education. How did a near-fatal accident lead me to Auschwitz with Eva? While sitting and recovering, I began to watch Netflix and one of the first movies I watched was “Forgiving Dr. Mengele.” I was intrigued and soon Netflix was leading me down a “Holocaust rabbit hole” with non-stop suggestions for my next movie. I admittedly became obsessed with the Holocaust and, hour after hour, for weeks, I watched one Holocaust-related movie or documentary after another. In pain from my severe injuries, and on heavy pain medicine, I often became distraught from what I was learning. My wife wanted me to stop “binge watching the Holocaust” because I was so upset and often weeping because of what I saw every day. I describe these revelations about the Holocaust as an event that “knocked the world's axis off-center” for me. I was simply astounded that such a deep and evil event took place. It shook me to the core. Then one day later that year, I got an email from CANDLES saying that there were only four spaces left for the trip to Auschwitz for the January, 2015 70th Commemoration of the Liberation of Auschwitz. I immediately told my wife I had to go and she agreed. Along with 70 others, I traveled to Poland and the trip changed the trajectory of my life. I learned and saw so much and being a photographer, I took thousands of photos. Often they were bleak and colorless photos that had a WWII look to them. I stood near Eva as she told her personal story where it happened, in a way that profoundly affects everyone. 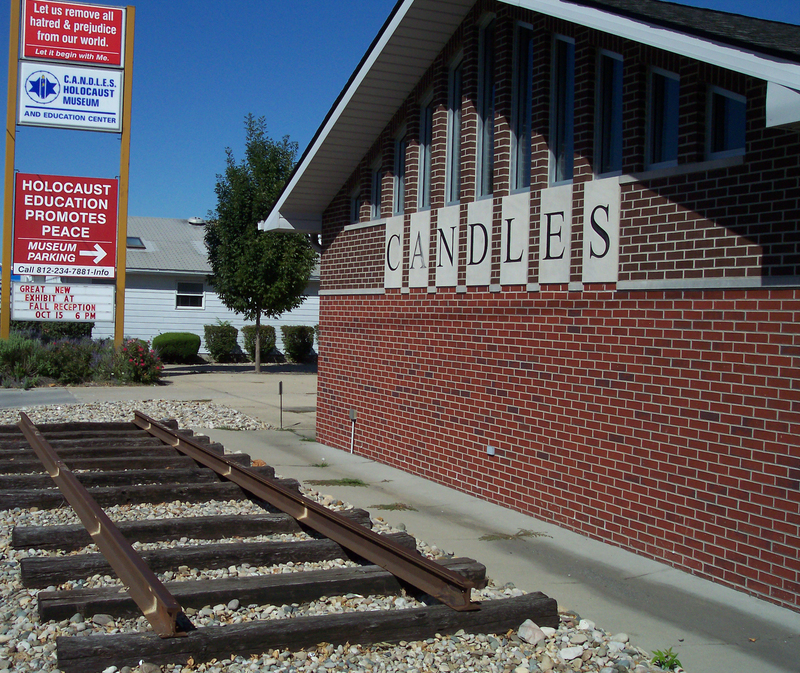 Upon returning home, I did my first lecture about my Auschwitz trip at my local library in Seymour, Indiana. The response was huge and I ended up doing three talks at my library and one in Columbus. My former student, Brielle Hill, was on the trip and I asked her to join me at these talks and she added so much sharing her younger viewpoint. I decided I wanted to do more talks and I felt I needed more information and experiences. I planned and made a return trip to Poland in the summer of 2015 and spent several weeks on my own filming at Auschwitz, Warsaw, Majdanek and Treblinka, before joining the Summer 2015 CANDLES tour group. I returned home and began advertising my “Journey to Auschwitz” lectures to Indiana public libraries and was soon booking talks all over the state. I always ask that any honorariums be sent directly to CANDLES and thankfully, nearly all of my talks result in a check being sent to the museum, which is personally very gratifying. I continue to do my talks, and each spring I speak to two groups of 180 freshmen at Columbus East High School. The teachers have told me that several students had been told by their parents that the Holocaust was not real, but after hearing me, they now know better. By the way, one year after my near-fatal accident, I recovered well and went back to the Indiana Trail 100 ultra race and completed 50 miles. I asked the then, CANDLES executive director, Kiel Majewski, if we could use the race as a fundraiser for the museum. With his enormous help, my race was able to raise over $13,000 for CANDLES. That amount was really not about me or the race, but was rather obvious proof of the love felt and shown by her supporters. And love is what we all feel for Eva. This past fall, I went on my third trip with Eva, this time to her home in Romania. To stand with her where she lived with her family and see the Solpersteines in the front yard, it made her losses seem more real to me than ever before. And to talk with her about her classroom experiences in the actual schoolhouse in Portz, was a powerful, never-to-be-forgotten moment. “None of this was on my radar”, but I am so grateful that my life experiences – even the painful ones – led me to Eva, her story and message of forgiveness this world needs to hear so much. And so, I will continue for many years to come, to share my experiences with Eva and details about the genocide, so the story of the Holocaust will never be forgotten. Eva tells those who travel with her and listen to her story, that they need to do something now to make the world a better place. I have taken that challenge to heart, and I will continue to tell my audiences why I just simply love this spunky, funny, feisty and dedicated woman – Eva Mozes Kor. Thank you Eva, for this journey. I love you!